As name denotes Continuous combustion gas turbine runs on gas. Basically, a turbine is a machine which is used as prime-mover to run other utilities in a power plant. There are various types of turbines but most popularly Continuous Combustion Gas Turbine is used in the engineering sector. 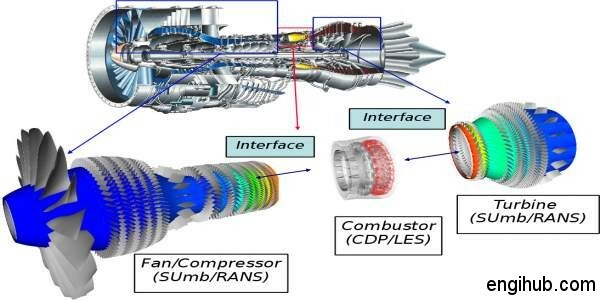 Among all turbines, I will like to share important information on Continuous Combustion Gas Turbine in this post. So, the Turbines can be divided into two main types. The constant volume type turbine works on the Atkinson cycle. It has become now outdated and has been superseded by the constant pressure type gas turbine (Continuous Combustion Gas Turbine). The combustion of fuel takes place continuously that is why it is called continuous combustion gas turbine. It works on Joule cycle. A compressed air up to pressure 1.5 to 4 kg/cm² is supplied to the combustion chamber where it is split into two parts. Some of the compressed air enters the burner and is consumed during the combustion of oil while the remaining air flows through the annular space between the walls of combustion and mixing chamber and the jacket of the burner from which some heat is absorbed by the air. This hot air then meets and mixes with the hot gases from the burner. So, it is clear that the quantity of compressed air supplied by the compressor for the combustion of oil in the combustion chamber is excess than required. The supply of excess air lowers the temperature of the products of combustion from the burner. Hence there is always a possibility of damage to blades and other components of gas turbine due to very high temperature. By the excess air, the temperature of the products of combustion may be lowered to about 600 to 800-degree centigrade. As this mixture of hot gases and the excess air passes over the various rings of moving blades of the turbine, it expands continuously and in the process, the pressure drops giving rise to an equivalent increase in the kinetic energy which is absorbed by the turbine rotor which is, therefore, imparting rotary motion. The gases leave the turbine at about atmospheric pressure. The turbine drives the compressor and the generator. So, the part of the turbine output which is used to drive the air compressor is called “Back Work”. To drive the plant generator only 25% of power is available because remaining 75% power developed by gas turbine is consumed by an air compressor. The safety valve is open and passes some mixture for lowering the pressure. It happens if the pressure of hot gases to the turbine becomes excessive. Hence the speed of turbine can be kept below a certain maximum value by proper design of safety valve. The motor is used for starting the turbine. The speed can be controlled by varying the supply of fuel oil. I hope this will give you some details about working of Continuous Combustion Gas Turbine.